Typing that is. And in a world of advanced technology, computers and the internet, it seems like typing would be an essential skill to know. The older my children get, the more I realize they will need this skill. 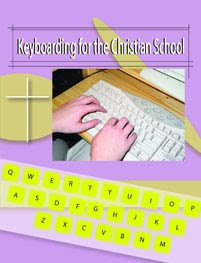 As a member of the Crew, I had the opportunity to download two programs from Christian Keyboarding for review. I looked over both of them and was able to pick which one would suit my children for the review. First I will share a little about both programs and then share which I choose and how we used it in our homeschool. Although not inherently "Christian" in the beginning lessons, it does have you typing Scripture to practice your typing skills once you learn the basics. It also includes some "inspiring" passages and a section on how to have a relationship with God (which I felt was very generalized). While I appreciated the no-frills, straightforward approach to the lessons, I do think it is a bit overpriced for an e-book. Even so, it has all of the information one would need to learn to type successfully. Here is how we used it: I chose the Elementary Version and used this with my 9 year old. I printed off a few lessons at a time and had my son type the lessons in an email and send it to me. This made it fun for him and he didn't mind doing it at all. Email is still novel to him, so this may have been why. But I think this will work well until we get to the lessons that require a Word Processor. (The lessons given are specifically for Microsoft Word.) The lessons are not thrilling, but this just may be the way to get all my boys to learn. I might have to tell them that if they do a lesson or two in keyboarding, then they may email a friend. I am worried what will happen when the novelty of email wears off, but I am hoping that they learn to type before it does! The added incentive is that if they learn to type, their computer time will "last longer." And I am sure they would love that! I invite you to read my Crew mates reviews of Christian Keyboarding, and encourage you to check out the samples if this program interests you. To visit the Crew blog, click on the banner below! I received these products for free for the purpose of this review and no further compensation was received. I offer my honest opinion. Please see my disclosure policy for more information. Introducing Whole Grain Baking . . .